We’re so happy with all the support our core fans gave us through our Product Hunt launch that we wanted to give you a behind the scenes account of what went down. Here’s a screenshot of our product as of 2.45pm September 27th. There are a ton of resources out there detailing how to have a successful launch on Product Hunt. You could spend weeks reading blog posts, checklists, tips and tricks. Eventually we had to just set a date and pull the trigger, so that’s what we did… Tuesday 19th September. So what are the goals of launching on PH? For those unfamiliar with Product Hunt, it’s a platform where people post products to the community, and these are then upvoted and and open for discussion. The hunter doesn’t have to have any link to the makers of the product, but you can also plan a little bit and get a hunter who has lots of followers and is influential within the community to try and gain a bit of an advantage. We wanted to gain this advantage so started planning how we might find someone suitable. So to find the top Hunters we looked at 500hunters.com, but as you can see it’s totally overwhelming. These people probably get hit up daily by random brands wanting their help, so we wanted to approach this differently. Ask a community that we are part of what they would do: the Hustle Ambassadors. (by the way the Hustle is a great daily newsletter, you can sign up here). Be a part of the PH community. This part was relatively easy, as I was already a somewhat active member of the PH community. Various articles recommended figuring out who had liked similar products to yours that might be interested in helping with your launch, and contacting them ahead of time. The goal is to get people to be beta testers of your product, and if you have an app or software product that’s pretty easy to do in a short time frame. Unfortunately, we didn’t have samples of Hydrant that were of high enough quality that we could ship out immediately. So this area is where we did not excel as much as we could have. Prepare a list of people you know on Product Hunt who can help you start the discussion and get some buzz going. This was great, but definitely involved a lot of “asks” which is something you have to get comfortable doing a lot in the launch phase. (Thanks to all those who have helped out!) We even referred a few friends to Product Hunt ahead of time to participate in the community ahead of time, knowing that we’d be launching there soon. The Product Hunt day starts and finished at 12am Pacific Time. The idea is you want to be at the top of the home page from the very beginning, as that’s what visitors to the site will see first. It leads to a bit of a positive feedback loop. We’re on Eastern Time here, so this meant a 3am wake up to answer questions once the product had been posted (hunted). Unfortunately, at 2.45am ET we discovered a scheduling conflict for our Hunter, so we were unable to post this evening, and instead pushed it back 24 hours. Wednesday 20th, 3.30am ET. Ready to go! By the time the post was up and I’d made my “Maker” introduction, it was ~1am PT. One thing we had not done was line up numerous friends to immediately weigh in with upvotes and discussion to push us up into those top 5 spots. By this time the number 1 product already 50+ upvotes, and the following 4 also had 10+ upvotes. Uh-oh. Not hitting that top 5 early on meant we weren’t going to get great visibility at all. Needless to say, after a couple nights of minimal sleep we weren’t feeling so hot at this news! Through various articles we had discovered that people arriving at product hunt directly on your page caused upvotes gained from those users to be valued less by the popularity algorithm. So at first we either told people to go to Producthunt.com and search for us or scroll down the front page. 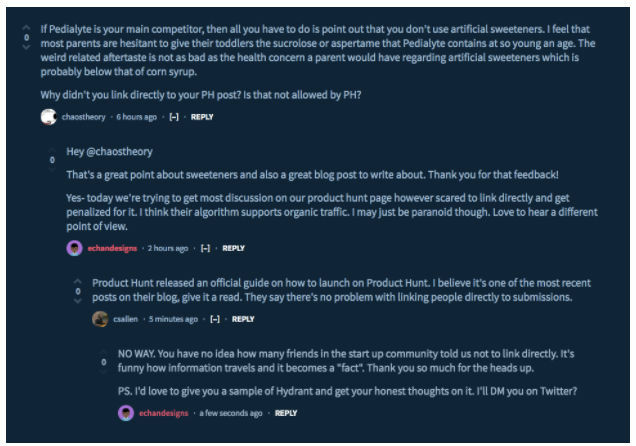 Eventually we uncovered a blog post from PH themselves debunking this myth thanks to @csallen pointing it out to us, so we reverted to sharing the direct link. Now the outreach to friends, family and our supporters to take a look at our page began. Product Hunt rules dictate that you can’t ask for upvotes, so instead you encourage people to “check it out” or “join the discussion”. By the late afternoon, it was clear that something we were doing was being penalized by the product hunt popularity algorithm. We had more upvotes and comments than ~8 of the products ahead of us (we were around the 16th-20th spot most of the day) but were being held down. The exact rules of the algorithm aren’t public, so this is conjecture, but we think this is likely because a lot of the accounts that upvoted us were newer, and connected to each other via Twitter/Facebook/Angellist. Hit up PH influencers as product testers ahead of launch. We’re talking 30-50 plus! Target more specifically our existing supporters who have active PH accounts and can actually get involved with the discussion. Post at 12:01am PT on the dot, and mobilize our early supporters immediately!